Septic Fizzytabs are a once a month septic tank treatment. Simply open the package, drop in the toilet, allow to dissolve and flush. Regular use of Septic Fizzytabs will eliminate septic tank odors and reduce the maintenance costs of your septic tank. The small spill kit is designed to clean up small petroleum spills ideal for golf courses, marinas, and heating oil spills. Buy the Small Spill Kit Here. Enough Custom HC to treat 5 cubic meters or 25 square meters. FREE US SHIPPING. Drain Line Fizzytabs and a drain maintenance and odor control product. 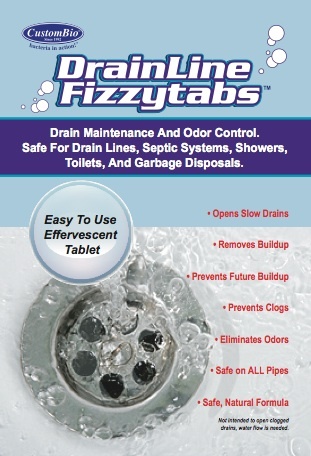 Drain line fizzys are great for drian lines, septic systems, showers and garbage disposals. 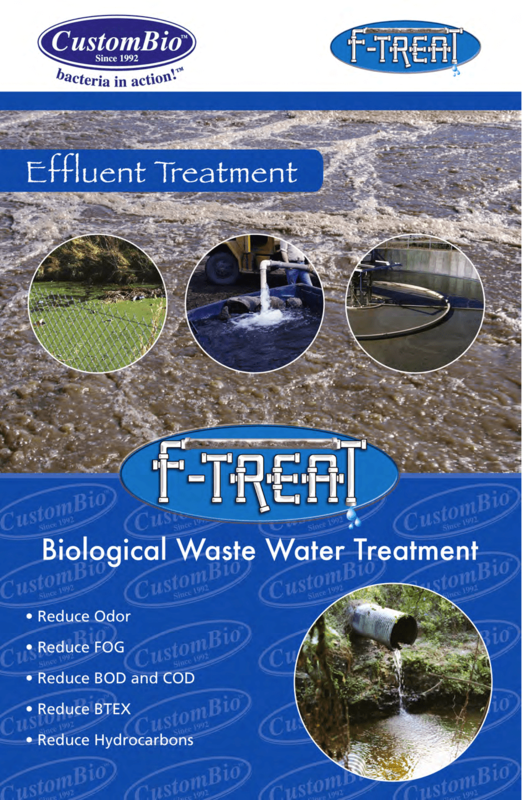 F-TREAT is effective with both industrial and municipal wastewater. The lift station maintenance kit and the lift station shock treatment both treat lift stations for FOG (fats, oils, and grease) and odor. Custom HC is designed to bioremediate hydrocarbons and petroleum compounds. One 8 ounce concentrate makes 55 finished gallons. The small spill kit is designed to clean up small petroleum spills ideal for golf courses and marinas. Custom HC Tabs are available in the Oil Water Separator Kit or in bulk cases of 60 tabs per case. Use a tube of fizzytabs and create your own 5 gallon pail of grease trap bacteria – WHY SHIP WATER? Finally! CustomBio offers a simple, do it yourself, car wash odor control product. Reduce or eliminate odors quickly, and cheaply, without the capital expense of additional equipment. Who wants to wash their car with water that smells like rotten eggs or gasoline? If your car wash has these problems then you need Car Wash Odor Control fizzytabs by Custom Biologicals. Buy Your Starter Car Wash Odor Control Kit Now! Biota Green is a probiotic for golf courses containing beneficial soil bacteria and beneficial soil fungi of the genus Trichoderma. Biota Green is specifically designed for golf course grasses. Each Biota Green tablet will treat 1/4 acre (1/10 hectare) of golf course greens and tee boxes.